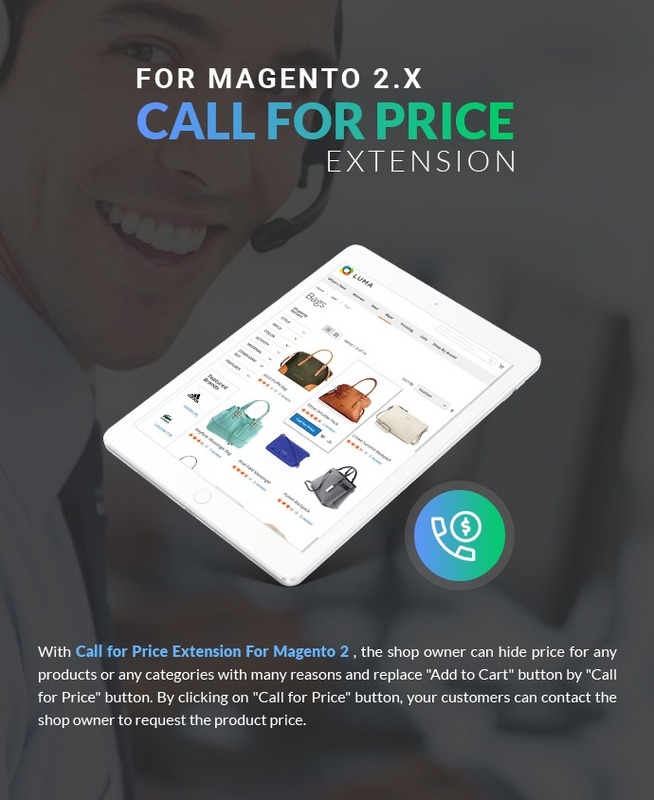 With Call for Price Extension For Magento 2, the shop owner can hide price for any products or any categories with many reasons and replace "Add to Cart" button by "Call for Price" button. By clicking on "Call for Price" button, your customers can contact the shop owner to request the product price. + It can be applied to specific Products, specific Categories, and customer groups. + Remove Price and replace "Add To Cart" button by "Call For Price" button. + Encourage customers to contact you. + Display "Call For Price" feature in many types of product. + Help your business understands more about the expected customers. + Email notification for admin will be saved and displayed in Magento admin. + Admin can customize module into "Make an offer". + Customers can make the request for a price with the submitting form on the product detail page, the product list page and the search result page, the wishlist page and the compare page. + Provide the additional information of the product which customers are interested in for shop owner. 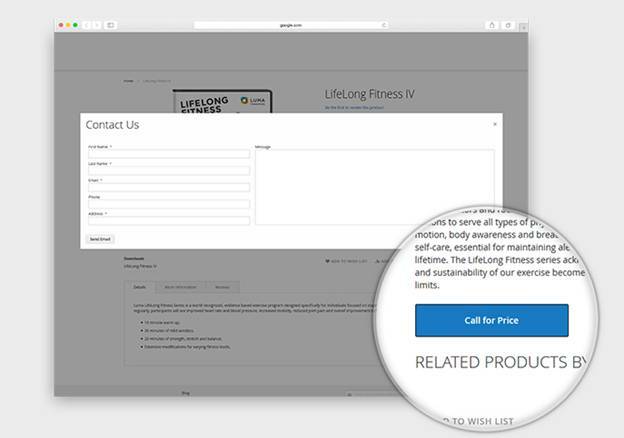 + Responsive "Call for price" popup form allows customers using anywhere. Step 1: You click on "Call for Price" button of the product you want to request the price on any page such as the product detail page, the category page, the search result page, the wishlist page and the compare page, then, a contact form popup will be displayed here. Step 2: Fill in the contact form popup with information such as First Name, Last Name, Email, Phone, Address, Price, Subject, and Message. Then, you click on "Send Email" button. You will receive notification “Send email successfully". Step 3: Check your email to view the reply information of shop owner. Step 1: Install Module. Unzip the installation package and copy "app" folder to your Magento root. Then, you run command line: upgrade, deploy, and clean. Step 2. Configure in the back-end. In the Magento admin panel, you go to CALL FOR PRICE-> Configuration. You can configure something here such as enable/disable module; option hide price for the customer groups, store view, categories, all product or special products; setting the button style. Remember to save the Configure. Step 3: Enable "Make an Offer" feature for each product. With products that disable "call for price" feature, you enable "make an offer" through going to Catalog -> find the product you want to enable "make an offer" feature -> click on "On" button for "Make an Offer" field. Step 4: View the customer request information. In the Magento admin panel, you go to CALL FOR PRICE -> "Call For Price" Request. You can view all customer request information here such as first name, last name, email, phone, address, price offer, and message. 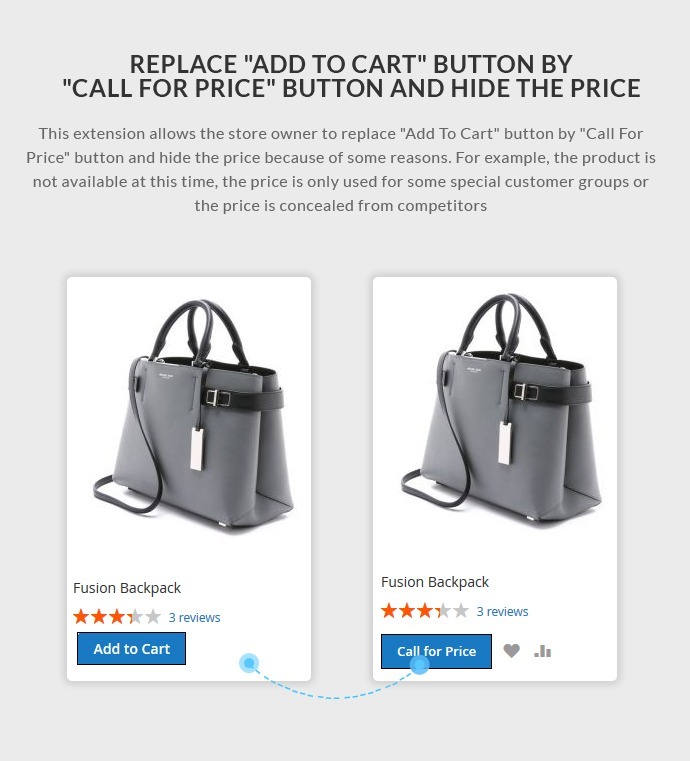 Replace "Add To Cart" button by "Call For Price" button and hide the price: This extension allows the store owner to replace "Add To Cart" button by "Call For Price" button and hide the price because of some reasons. For example, the product is not available at this time, the price is only used for some special customer groups or the price is concealed from competitors. 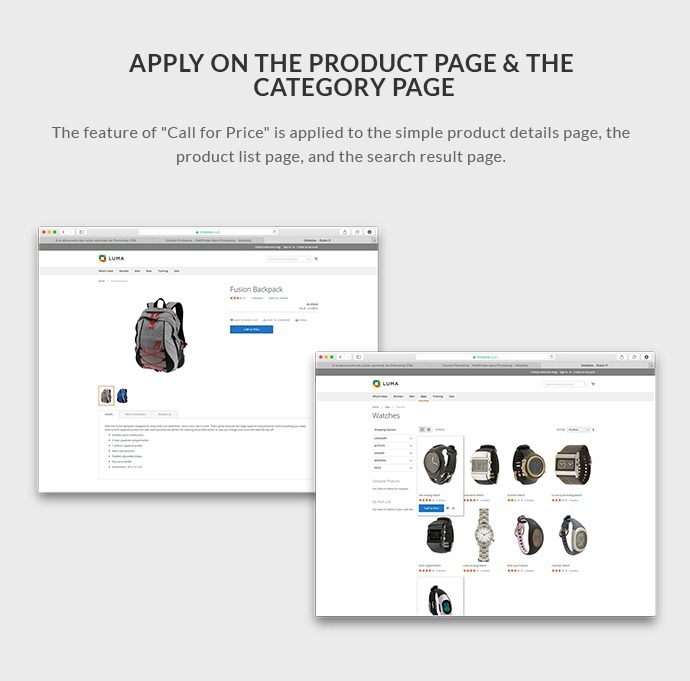 Apply on the Product page & the Category Page: The feature of "Call for Price" is applied to the simple product details page, the product list page, and the search result page. 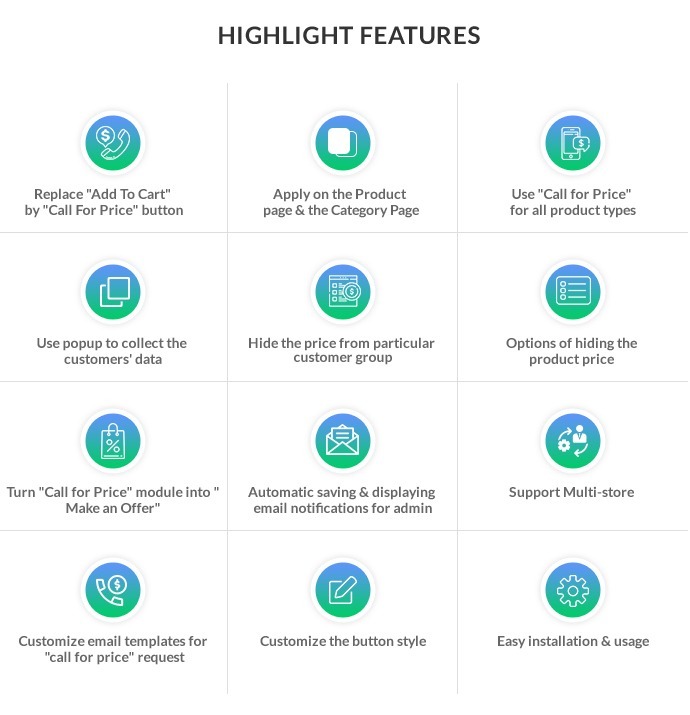 Use "Call for Price" for all product types: You can use call for price for various types of products such as the simple products, the configurable products, the virtual products, the downloadable products, the grouped products and the bundle products. Use popup to collect the customers' data: When you click on "Call For Price" button, a popup will be displayed and you have to fill full required information such as First Name, Last Name, Email, Phone, Address, Message, Price and tick on "Security check" (if have). Finally, you click on "Send Email" button and wait for the reply from the shop owner. Options of hiding the product price: Admin can enable “Call for Price" feature for all products, the specific categories or the specific products in the admin panel with Options of hiding the product price. Turn "Call for Price" module into "Make an Offer": "Make an Offer" feature is used for products with "Add to Cart" button and the price is available. Your customers still see the product price and make an offer to bargain the price level they want. 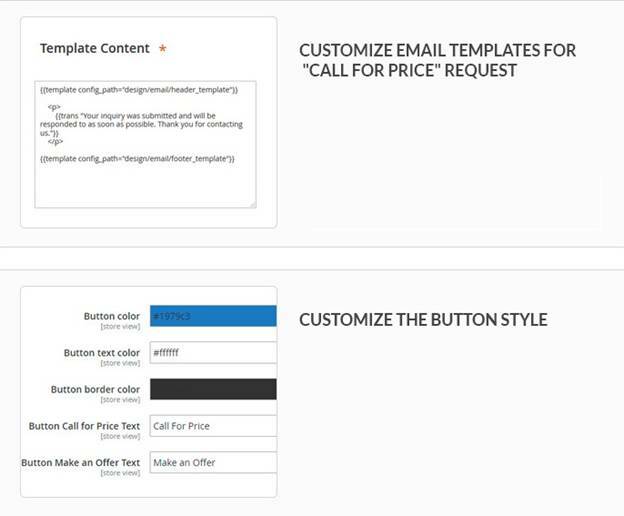 Customize email templates for "call for price" request: Admin can also set custom email templates for "Call for price" request. Customize the button style: You can change the text, background color, text color of the "call for price" button and "make an offer" button. Support Multi-store: You can enable "Call For Price" feature for the selected store view in the backend. With products that are re-sold below cost, or you have items we cannot explain the price, this extension is so suitable! I was satisfied when it allows inserting a customized message that is displayed by your client via pop-ups! Five star for quality! Can I use this Call For Price For Magento 2 for all product types? Yes. 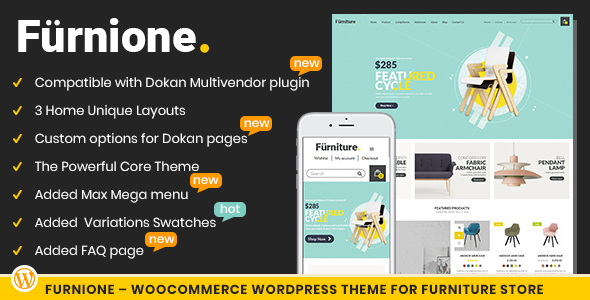 You can use this extension for all product types such as simple products, the configurable products, the virtual products, the downloadable products, the grouped products and bundle products. Is this Call for Price extension for Magento 2 responsive? Yes. It is responsive. It can adapt any screens as desktop, tablet or mobile. How to get the customer’s information in the back-end? Login Admin -> Call for Price-> Call for Price Request, then you will see “the list of customer to register” in which you can find the customers’ information. Can I enable/ disable “call for price” button in the front-end? Does “Make an Offer” button disappear if we enable Call For Price? Yes, exactly. One of them will display when we disable the rest one. Can admin hide the price from particular customer group? Can the customer’s information be saved automatically in the system after they send email successfully? Yes. After customer sends the email successfully, the system will be automatically saved the customer’s information in the back-end. Yes. You can change the text, background color, text color of the "call for price" button and "make an offer" button. How to hide price for a group of customer? Yes, you can. It depends on the domain license support that you purchase. I did the payment, while I have not received the downloadable link? Which factor decides the success of your online business? Absolutely, there are many different factors and each of them can be added in various ways like the first performance, easy-navigation, comfort and your support. Among them, user-experience includes almost factors from easy-navigation, comfortable to do shopping, saving time for customers and other. 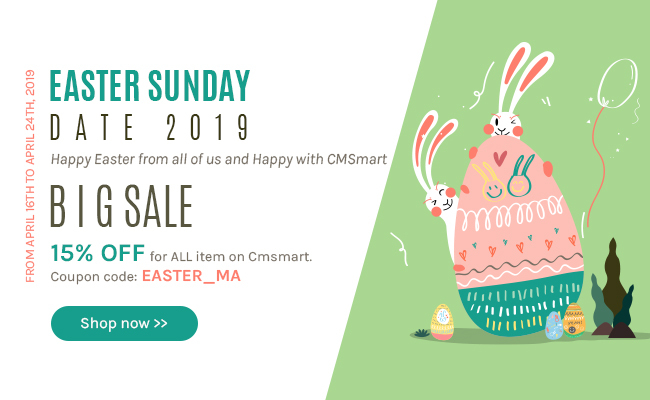 That is the reason why e-commerce solution providers focus on developing and creating more and more extensions in hope improving your service and your website performance. Magento 2 has been added a lot of awesome features thus it will be great if it is added more beautiful functions, encouraging more sales and loyal customers. Call for Price feature gives your customers ability to ask for their wanted price and make an offer of the product price. 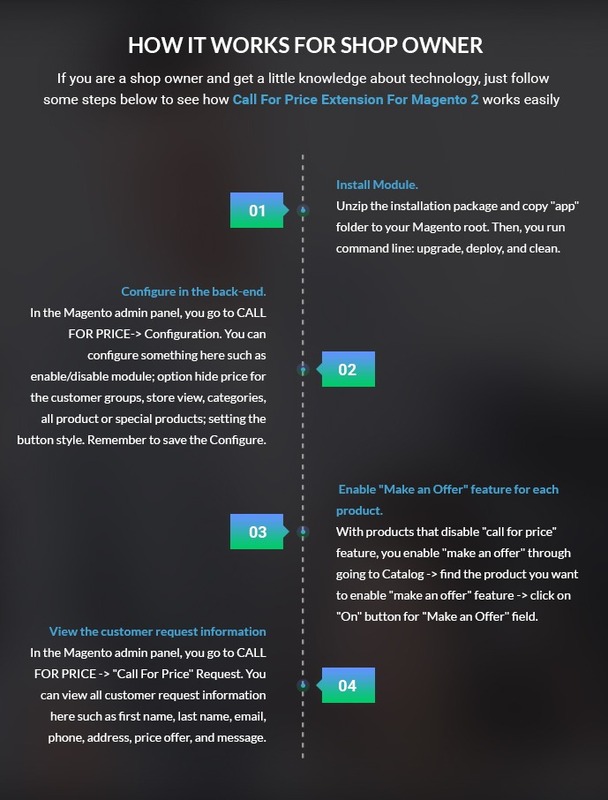 It can be said that Magento 2 Call For Price is a new add-on that cannot be found popularly. 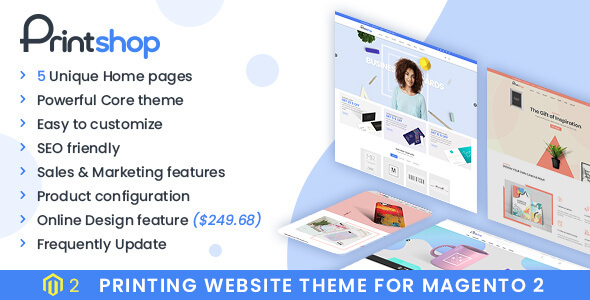 After installing the module for your site, you will receive the amazing result of your sales and many positive comments of your beloved customers. You can use the module for specific products, categories or customers groups as you want. Especially, you want to have a specific price for your certain customer group like VIPs. Boost your site and e-service to the upper level, more professional. Increase sales and revenue, as the result. You just take some minutes and three steps to complete the easy installation as well as configuration. Then, letting it thoroughly run on your site and ultimate awesome features of the module. With this extension, you can replace “Add To Cart” button “Call For Price” button and hide the price because of some reasons. For example, the product is not available at this time, the price is only used for some special customer groups or the price is concealed from competitors. And Apply the feature of “Call for Price” the simple product details page, the product list page, and the search result page. You are able to use this feature for various types of products such as the simple products, the configurable products, the virtual products, the downloadable products, the grouped products and the bundle products. The customer enjoys this function through a popup. When a customer clicks on “Call For Price” button, a popup will be displayed and he/she has to fill full required information such as First Name, Last Name, Email, Phone, Address, Message, Price and tick on “Security check” (if have). Finally, clicking on “Send Email” button and wait for your response. Hide the price from a particular customer group if you set the hidden product price for the selected customer groups in the back-end with this extension. Admin can enable “Call for Price” feature for all products, the specific categories or the specific products in the admin panel with Options of hiding the product price. 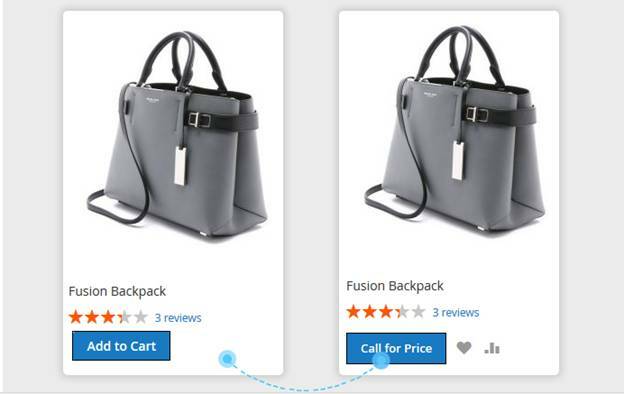 Turn “Call for Price” module into “Make an Offer”: “Make an Offer” feature is used for products with “Add to Cart” button and the price is available. Your customers still see the product price and make an offer to bargain the price level they want. Now, for your current Magento 2 Store, do you have enough reasons to add this latest feature? 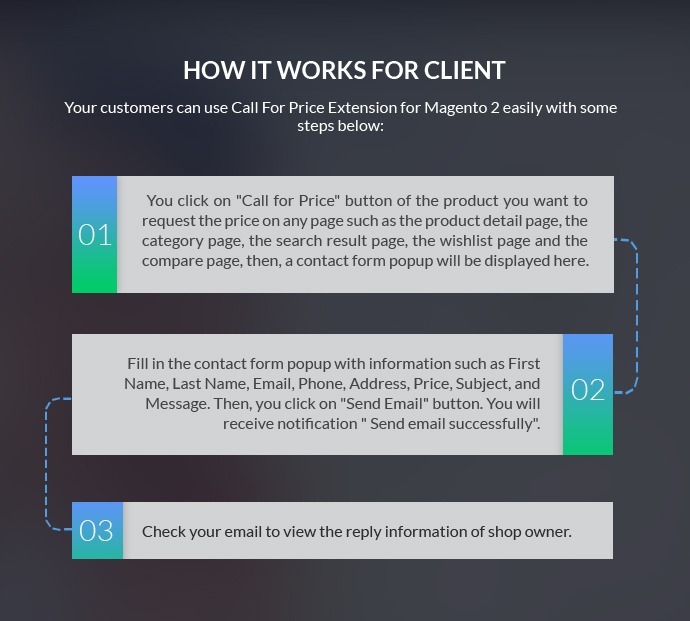 So, please take a visit of the demo of Magento 2 Call For Price extension and understand it more.